Not to worry. So another lunatic left-wing therapist has decided that you’re looney tunes, and of course Newsweek swallows this malarkey and spits back out at us, but what does that prove beyond another manifestation of BDS? If their own fragile psyches insist on pinning this donkey tail on you, Mr. Bush, ’tis a fine day to be whacko, sire. 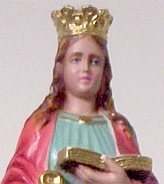 Being a Methodist and all, you wouldn’t know it, but today, May 15th, is Saint Dymphna’s feast day. Being the patron saint of lunatics, she has had a full job on her hands in the United States these last six years as Bush Haters have repeatedly impaled themselves on their swords because they can’t get rid of you or that sidekick of yours, Cheney. On May 15, the Church marks the feast of a saint who is at once somewhat obscure and extremely significant. At first blush, St. Dymphna’s story is quite a sad one. According to her widely popular legend, this early medieval girl was the daughter of a petty, pagan Irish king. Like her mother — whom she very much resembled — she was a Christian. When the queen died unexpectedly, the king was crazed with grief, and announced that he would marry his daughter. Dymphna had the normal reaction: She went to Belgium. Her father tracked her down in the town of Gheel, where he watched as she was put to the sword. All in all, a dark family romance that sounds like a rejected first draft of a Faulkner novel. But the story does not end here. St. Dymphna was buried in Gheel, where she was martyred, and a shrine was built in her honor. Several centuries later, a group of “madmen” who’d been driven from town to town happened upon the shrine — and were miraculously cured. Word of this cure spread quickly, in a world without Paxil or Lithium, and soon large numbers of mentally afflicted pilgrims began to descend on the town. Instead of locking them up, or burning them as “witches,” the Christian folk of the town admitted the pilgrims to their homes to await their cure. From this unlikely beginning came the West’s first humane facilities for treating the mentally ill. To this day, pilgrims and patients come to Gheel and are welcomed by the locals. To honor this saint and the heritage of her shrine, I suggest you turn your home into a little Gheel for a day, by throwing a party for your most insane friends and relatives. You know — the people you’re afraid to invite other times, because you never know what they’ll say, or onto whom they’re liable to spill the punchbowl. The old man from the parish who takes you aside after Mass to explain that the Freemasons control the weather; the Pentecostalist sister-in-law who burned the family TV on the lawn, your brother the failed seminarian, your aunt the Scientologist screenwriter. And of course, both your crackpot parents. Ah, yes. Our crazy families. Yours is pretty normal, Mr. President. No brothers in overalls swilling beer at the gas station and telling Jimmah tales, no coke-snorting relatives you have to hide in the closet, no brothers-in-law involved in shady deals. Come to think of it, whatever did become of Hillary’s brothers? Are they going to be hot on the campaign trail next year? Actually, Mr. Bush, your family probably considered you the bad boy. And then you cleaned up your act and got religion. It’s this last part — the evilvangelical — that the sneering classes can’t forgive in you. Religion is so… so… well, tacky, sir. Tacky, yes. C'mon; the Leader of the free world believes in a mythical 'man in the sky'. It's...embarrassing. Isn't Patrick the patron saint of the insane? Nah...only the ones within the boundaries of Eire. Dymphna's more transnational than that. "only the ones within the boundaries of Eire." I confess I never heard of your namesake. But she sounds interesting.